The basic thing about Slavoj Žižek is that he's a good old-fashioned Marxist of the purest kind. In fact he more or less says so himself. He has certainly classed himself, many times, as, variously, a "radical leftist”, a "communist in a qualified sense”, and, yes, a “Marxist”. So this isn't a case of some mad 'far-right conspiracist' accusing everyone who dares to disagree with him of being a Marxist. Žižek classes himself in this way. 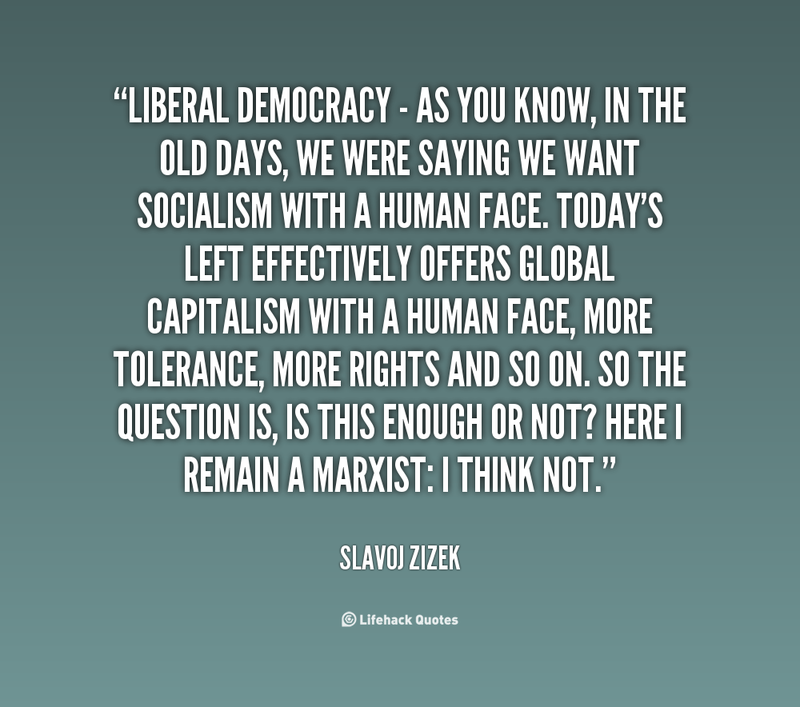 Yet there's a big difference between Žižek and the old-school Marxist. 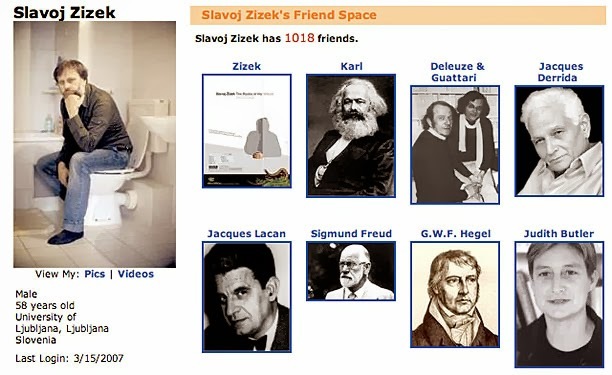 Žižek is a Marxist who has drunk deep from the wells of postmodernism, post-structuralism and structuralism (as well as from other Continental fashions). He knows his Jean-Francois Lyotard, his Jacques Derrida and his Michel Foucault. (He first published Derrida, for example, way back in 1967.) Žižek knows his (non-Marxist) Continental philosophy very well. Why? Primarily because all that knowledge will make it all the easier for him (or so he thinks) to trounce or dispatch the rivals to traditional Marxism. It has also enabled him to make revolutionary Marxism more philosophically fashionable and up to date! Sure, many hard-core Marxists before Žižek have also got to know their non-Marxist philosophical – though still 'radical' – rivals or enemies. In fact some have committed the sacrilegious act - against Marxism - of borrowing technical details, jargon and other stuff from such sources. Louis Althusser, for example, raided the graves of psychoanalysis (as has Žižek), structuralism, etc. Žižek's pure Marxism is also somewhat disguised by his prose style; not just by his interest in non-Marxist philosophy. However, if you cut out the jargon, the unbearable pretentiousness, the convoluted (i.e., the endless clauses, few full stops, etc.) style, the stream-of-consciousness improvisations, the copious footnotes and the academese, etc., you will find the purist Marxist messages and positions you could ever hope to find. In fact the bottom line is that they seem, in the end, to be largely untouched by the postmodernisms, post-structuralisms, etc. he argues against. As I said, it may simply be that he has largely got to know all – or much – of this non-Marxist stuff simply to offer a Marxist refutation or correction of it. 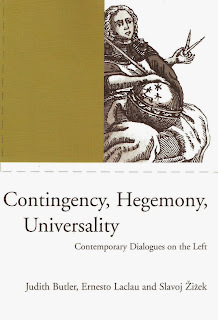 Indeed just as much Continental philosophy disguises its banality and truisms in pretentious prose, so Žižek hides his commonplace Marxisms with an equally pompous prose. After all, he has engaged with some of the most pretentious post-modernist and post-structuralist writers on the planet. He could hardly come out with the tabloid stuff (the “gutter journalism”) you find in, for example, Socialist Worker - even if his views are very similar, fundamentally, to what Trotskyists, etc. propagate. So, again, all the jargon, academese and pretentiousness (e.g., the references to Jacques Lacan and “the Real”) seem to have the function of hiding the commonplace, banal and often blatantly false or inaccurate Marxist positions and theories which hide underneath. Žižek, in other words, keeps to Marxist fundamentals; just as all Marxists must do otherwise they simply wouldn't be Marxists. i) Capitalism has an essence and it is everywhere. It explains everything because it is the very essence (yes, essence) of everything. ii) Following from i), there must therefore be a total (violent) revolution. 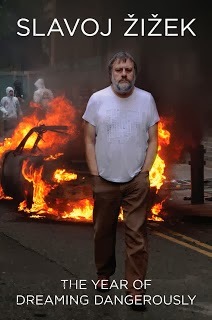 It's clear that Žižek - both here and elsewhere - completely endorses that position. That quote fully encapsulates the well-known Marxist notion of the relation between “base” and “superstructure”. In fact this is the very thing that sophisticated Marxists - from Eduard Bernstein onwards - began to play down. Nonetheless, it's rejection – amongst the rejection of other Marxist (religious) 'laws' and fundamentals - was also the very thing which pious Marxists realised was sacrilegiously unMarxist and even counterproductive in terms of praxis. All this involves a dilemma which Marxists must face. The more sophisticated Marxist positions become the less people understand them and the less they fire-up the people to embrace Total Revolution. In other words, you either have Marxist sophistication and no revolution; or Marxist simplicity/fundamentalism and at least a stronger possibility of revolution. That's why there's often been a disconnection between Marxist political parties/movements and Marxist intellectuals. The Marxist political parties - being political parties - knew all along that the more sophisticated Marxism became the less people would understand it and, as a consequence, the fewer people would therefore be inspired by it. (Hence Marx's very own Communist Manifesto.) Many Marxists believe, at least silently, that it doesn't help the revolution one bit to make Marxism too sophisticated. Keep Marxism religious in nature and tone. Keep it simple, absolutist, essentialist, messianic and millenarian otherwise there's simply no point. Žižek himself (despite his prose style) realised all this and that's why he thoroughly endorses the Lukács position above. More specifically, Žižek believes that capitalism “overdetermines” everything – literally. It can be found everywhere – literally. In contradiction of what Žižek claims postmodernists, post-structuralists, etc. believe, capitalism is not just about “the particular domain of economy”. It's about everything. Its domain ranges from “politics to art and religion”. It's also about – or “determines” - the family, sexism, racism, homophobia, Islamophobia, Islamic terrorism, science.... everything. 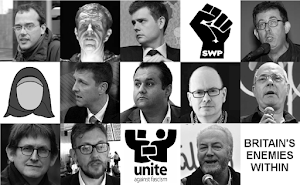 (Read The Guardian’s Seumas Milne – he fully agrees with such Marxist totalism.) In Žižek words, capitalism, or the economy, “overdetermines the social totality”. Despite all this openly acknowledged capitalist freedom, Žižek still has hopes that things will change. He follows the just-quoted passage by saying that “the capitalist system is thus more vulnerable than ever today” (329). “Marx's old formula still holds: capitalism generates its own gravediggers.” With these words, Žižek shows us how pure and pious his Marxism is. He offers us that old chestnut: capitalism “is thus more vulnerable than ever today”. Classic! I just can't comprehend why Marxists seem to lack even the most basic skills of self-analysis and self-criticism. Marxists - as everyone knows (perhaps Marxists do too) - have been saying this every decade for the last, roughly, 160 years. Every year Marxist groups talk about the “capitalist crisis” and even about the “final capitalist crisis”. The talk of capitalist crises can be recalled from the 1980s and it is replicated today; just as the warnings in the 1980s replicated those of the 1970s and so on back to Marx's own day. All this crisis-talk is pretty mindless stuff when you think about it. Except, of course, that every new “capitalist crisis” is indeed slightly different to the last one. The content is slightly different; even though the crisis part of the scenario remains the same. In Marx’s day, the “pauperisation of the working class” etc. accounted for the final capitalist crisis. In the 1980s, it was the large levels of unemployment, etc. In the 1990s it was the “contradictions of global capitalism”. In 2000, in Žižek's case, post-mod “subjectivities” may well have taken capitalism over the edge. The “subjectivities” which capitalism enables are actually bringing about a “dissolution of all substantial social links and also lets the genie out of the bottle” (329). These “hybrid entities” (whatever they are) will “set free the centrifugal potentials that the capitalist system will no longer be able fully to contain”. In other words, Žižek, as a typical Marxist, is grasping at straws. And he does so because he has a deep faith in the collapse of capitalism; just as he has a deep faith in Marxism itself. He is a believer. No matter what the situation will be in, say, 2020 or 2050 (just as was the case for Marxists in the 1980s and 1880s), he will remain a believer. Even if capitalism has achieved social peace, full employment and nirvana; it would still be social peace, full employment and nirvana within the “frame” of capitalism. Besides which, as a Marxist, he would inevitably find problems with capitalist social piece, capitalist full employment and capitalist nirvana; just as when, in the 1950s and early 1960s, capitalism (in the West) created full employment and social peace (at least to some extent), Marxists still had massive problems with it. Marxists will always have a problem with capitalism. If they didn't have a problem with capitalism - no matter what shape capitalism actually takes - they wouldn't be Marxists. What has also got the Marxist's goat is the (capitalist?) 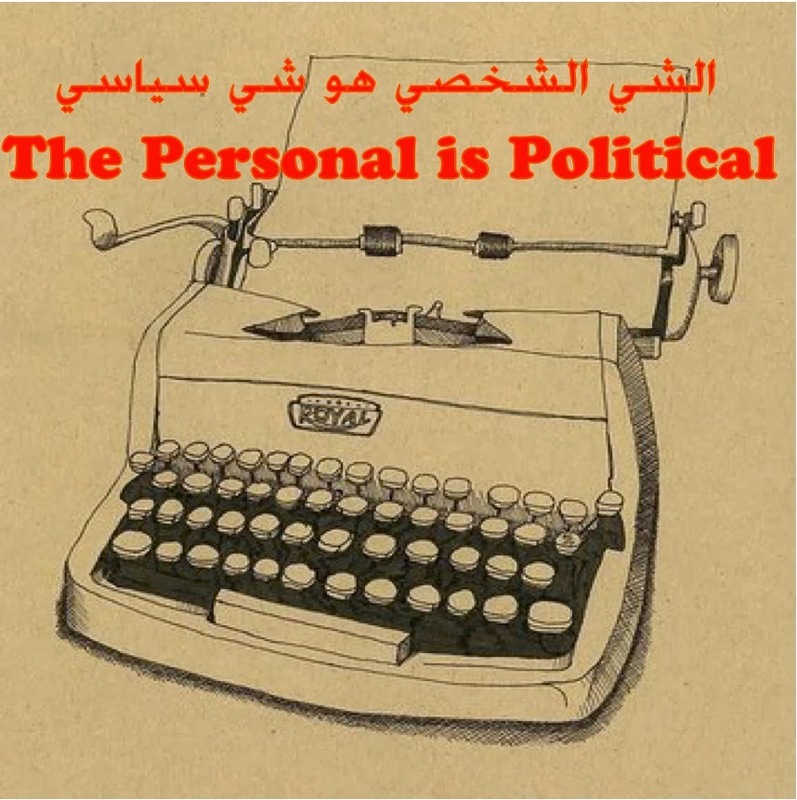 distinction between the private and the political. This ties in with the views that capitalism “permeates”, to use Žižek's word, every aspect of society. It is still well-known that in the 1960s feminists, and many others, tried to blur the distinction between the private/personal and the political and indeed they came up with the slogan: “The personal is the political.” Of course Marxists are primary concerned with making the economy political and, in tandem with that, convincing us that capitalism permeates the private or the personal. 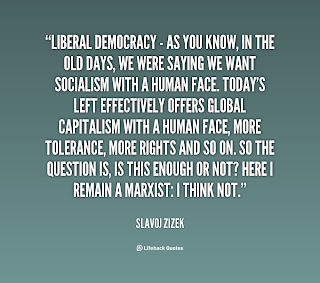 And just as Žižek rejects the political/non-political division when supposedly upheld by post-mods, he is, of course, equally against it when upheld by the capitalist Right: who, according to the Marxist tradition, more or less invented the division. Thus Žižek now questions the split between “state and civil society”. (His totalitarian intent deepens yet more.) He claims that “[e]ven the very opposition between the state and civil society is thoroughly ambivalent today” (314). 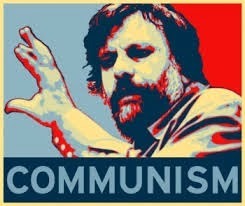 1 Žižek, so some Marxists say (though it's not entirely true), rejects the Marxist notion of ideology as 'false consciousness' (except, of course, when that ideology is Marxism). Apparently Zizek explains things in terms of people's unconscious motives instead. Presumably that's because the unconscious is the unconscious, it makes no sense to call it 'false'; though I may be wrong. 2 Žižek would happily admit to being a totalist quite simply because the “totality” - his own word - that is capitalism demands its own totalist response.